For many of us who travel, an airport is usually the first (and last) experience we have of a country. As a result, many nations have spared no expense in transforming these points of entry into cultural showcases and well-appointed commercial enclaves. Indeed, several of these airports have also become iconic examples of architecture and design. Quite recently, a Filipino airport has now been added to that illustrious list. Seen as the main entry point into the Central and Southern Philippines, the Mactan Cebu International Airport (MCIA) welcomes millions of domestic and foreign travellers per year and has consistently made it to the Top 20 list of Asia’s best airports, rising to 13th overall as of October 2017. However, the MCIA’s original design could only accommodate 4.5 million travellers annually—a number which has, since its last renovation in 2010, more than doubled as it receives over 10 million visitors per year. This called for more than just a renovation; plans were made for the construction of a new terminal that would enable the airport to accommodate 12.5 million travellers per year on average. But while increased capacity and functionality were on top of the list of priorities for this development, there was also a need to infuse the property with a distinctive Filipino aesthetic that could capture the beauty and hospitality of the Queen City of the South. The end result: the show-stopping structure that is MCIA’s recently opened Terminal 2. Formally inaugurated last 7 June, the new terminal is located about five hectares south of the original MCIA structure. It is part of the ongoing airport upgrade which was initiated on 29 June 2015 during the time of President Benigno Aquino III. Worth Php 17.52 billion in total, the full extent of the upgrade is considered the country’s first airport-centric public-private partnership (PPP). The three-storey, 65,000sqm Terminal 2 was built by a consortium between local builder Megawide Construction Corporation and GMR Infrastructure Ltd of India. Its design, on the other hand, came about through the collaborative efforts of Architect Winston Shu of Hong Kong’s Integrated Design Associates Ltd (IDA), the award-winning team at Budji+Royal Architecture+Design, and internationally renowned furniture designer and native Cebuano Kenneth Cobonpue. The surrounding waters and the shoreline, nevertheless, became the inspiration for the actual design of the airport. The terminal’s structures are a series of 15x30m arches that, when seen from a distance, call to mind the undulating waves. Likewise, the floors take inspiration from the province’s famed beaches as pieces of locally-sourced mother-of-pearl are embedded into the glistening white surface. The structure is further divided into departure and arrival areas by a two-storey walkway overlooking a green space below. At the same time, the new terminal is also a working example of sustainability on an institutional level. Working counters are made from locally sourced materials such as rattan. Glass walls allow a large amount of natural ambient light into the structure, minimising the need for electrical lighting in the daytime. Another interesting point is how very little steel was used in the construction of the gracefully arched roofs; instead, the massive arches were made of glue-laminated spruce lumber (a material referred to as glulam) from the Austrian lumber company Rubner Holzbau. Indeed, the glulam beams supporting the structure serve to enhance the play on culture and tradition, evoking the bare beams found in native homes throughout the archipelago. “This was where we really went for authenticity,” Pineda declares with pride. Such has been the appeal of this unique design that MCIA Terminal 2 has won international design awards long before it opened to the public: the 2016 Autodesk BIM Merit Prize, as well as the 2017 Kohler Bold Look Award. The terminal was also nominated for the Hong Kong Green Building Award in 2016. But MCIA Terminal 2 is more than just a spectacular design showcase that presents the brilliance of local talents collaborating with some of the world’s best in the field of construction. In terms of functionality, it is set to ease some of the str ain experienced at Terminal 1 as some major air carriers will be assigned to land exclusively at the new facility. At present, there are 48 check-in counters, which can be further expanded to a total of 72, as well as seven passenger boarding bridges. 12 escalators and 15 elevators have been installed to help passengers get around the facility faster, and the parking lot can accommodate a total of 550 vehicles at any given time. Even security checks are made easier by the addition of an Automatic Tray Return System (ATRS) which minimises the need to look for trays in which to put one’s belongings at the x-ray counters. 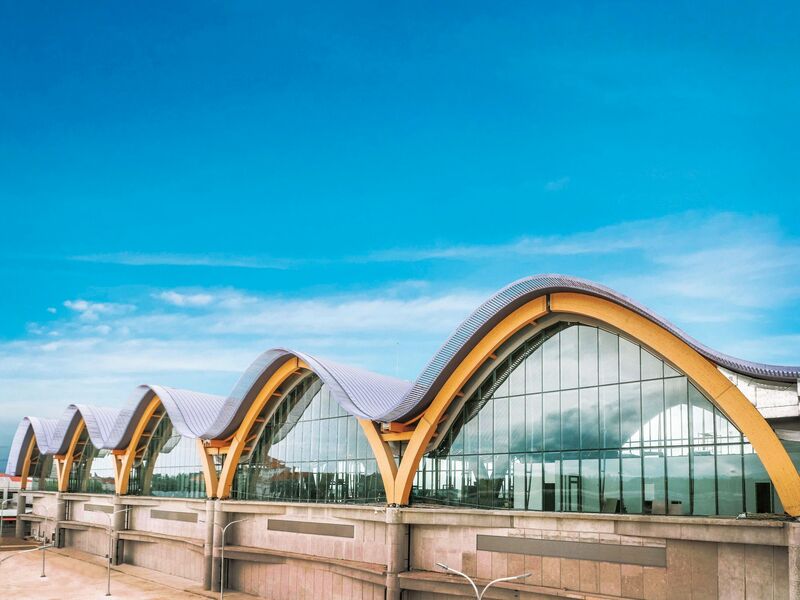 As MCIA Terminal 2 opens its doors to the travelling public, one may think that the local talents who played a role in its unique design would be more than happy to bank on this particular success. But this is just one among several institutional projects currently being undertaken by Budji+Royal, as the team is also working on a fresh design for the Clark International Airport in Pampanga—once again bringing Filipino warmth and flair to welcoming the world to our shores.